Cats love clawing up carpets and drapes. While this usually wrecks everything in the house, don’t think a scratching post alone will solve the problem. Besides the trick of getting your cat to give up a sofa or carpet for a scratching post, the other trick is noticing what types of surfaces your cat enjoys clawing the most. Cats who wreck sofas and drapes prefer vertical scratching surfaces such as those found in traditional scratching posts. Other cats who wreck carpets prefer flat scratching surfaces such as those found in scratching pads that lay flat on the floor. 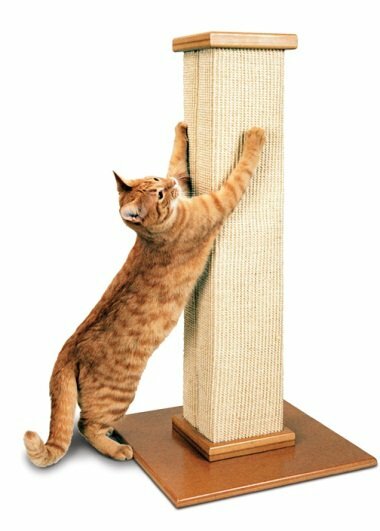 Who know there could be so many considerations in choosing a scratching post? But the more you live with a cat, the more you’ll learn that cats are rarely logical, which makes them perfect training for anyone who eventually wants to raise kids.